Guillermo del Toro’s “The Shape of Water” has been named the best-produced film of 2017 by the Producers Guild of America, an honor that has typically been one of the most reliable indicators that a film is on track to win the Oscar for Best Picture. In the television categories, “The Handmaid’s Tale” won for drama, “The Marvelous Mrs. Maisel” for comedy and “Black Mirror” for long-form TV. Pixar’s “Coco,” to the surprise of no one, won the award for animated feature, while “Jane” won the documentary award. The awards were handed out during a ceremony at the Beverly Hilton Hotel in Los Angeles and were the first of the four major guild awards to be presented this year. The Screen Actors Guild Awards will follow on Sunday. In the past, the win might have suggested that “The Shape of Water” is now the prohibitive favorite to win the Oscar for Best Picture, because the Producers Guild Award has gone to the eventual Oscar winner far more often than not over the years. And after the Academy and the PGA both expanded their roster of nominees from five to 10 in 2009, the guild became the only other awards body to tally its final votes using the same preferential system as the Oscars. For the first five years after the change was made, the Producers Guild Award accurately predicted Best Picture every time. But in 2014, Oscar winner “12 Years a Slave” tied with “Gravity” at the PGA — and after a match on “Birdman” in 2015, the two groups disagreed the last two years in a row, with “The Big Short” and “La La Land” winning PGA and “Spotlight” and “Moonlight” taking the Oscars. 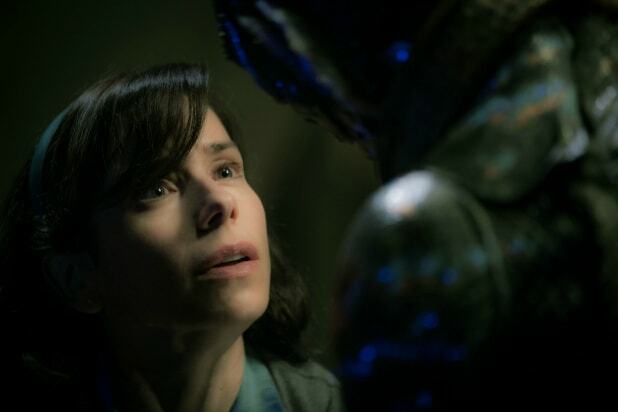 In an unsettled year in the awards race, that means “The Shape of Water” may still be vulnerable to an upset by a different film, despite its strength with the producers. 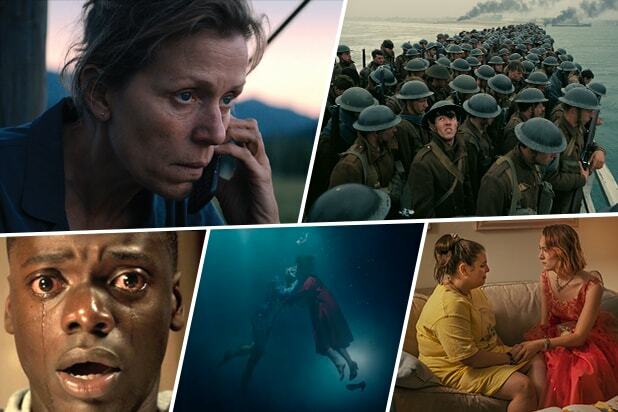 Best Picture predicted nominees, in order of probability: "The Shape of Water," "Lady Bird," "Get Out," "Three Billboards Outside Ebbing, Missouri," "Dunkirk," "Call Me by Your Name," "The Post" • If there are three more nominees: "I, Tonya," "The Florida Project," "The Big Sick"
Best Director predicted nominees: Guillermo del Toro, "The Shape of Water"; Christopher Nolan, "Dunkirk"; Martin McDonagh, "Three Billboards Outside Ebbing, Missouri"; Greta Gerwig, "Lady Bird"; Jordan Peele, "Get Out"
Best Actor predicted nominees: Gary Oldman, "Darkest Hour"; Timothée Chalamet, "Call Me by Your Name"; Daniel Day-Lewis,"Phantom Thread"; Daniel Kaluuya, "Get Out"; James Franco, "The Disaster Artist"
Best Actress predicted nominees: Frances McDormand, "Three Billboards Outside Ebbing, Missouri"; Saoirse Ronan, "Lady Bird"; Sally Hawkins, "The Shape of Water"; Margot Robbie, "I, Tonya"; Jessica Chastain, "Molly's Game"
Best Supporting Actor predicted nominees: Sam Rockwell, "Three Billboards Outside Ebbing, Missouri"; Willem Dafoe, "The Florida Project"; Woody Harrelson, "Three Billboards Outside Ebbing, Missouri"; Richard Jenkins, "The Shape of Water"; Armie Hammer, "Call Me by Your Name"
Best Supporting Actress predicted nominees: Allison Janney, "I, Tonya"; Laurie Metcalf, "Lady Bird"; Holly Hunter, "The Big Sick"; Mary J. Blige, "Mudbound"; Octavia Spencer, "The Shape of Water"
Best Original Screenplay predicted nominees: "Three Billboards Outside Ebbing, Missouri," "Lady Bird," "Get Out," "I, Tonya," "The Shape of Water"
Best Adapted Screenplay predicted nominees: "Call Me by Your Name," "Molly's Game," "The Disaster Artist," "Mudbound," "Wonder"
Best Cinematography predicted nominees: "Blade Runner 2049," "Dunkirk," "The Shape of Water," "Call Me by Your Name," "Mudbound"
Best Film Editing predicted nominees: "Dunkirk," "The Shape of Water," "Get Out," "Baby Driver," "Three Billboards Outside Ebbing, Missouri"
Best Production Design predicted nominees: "The Shape of Water," "Blade Runner 2049," "Beauty and the Beast," "Darkest Hour," "Murder on the Orient Express"
Best Costume Design predicted nominees: "Phantom Thread," "Beauty and the Beast," "I, Tonya," "Darkest Hour," "The Greatest Showman"
Best Makeup and Hair Design predicted nominees: "Darkest Hour," "I, Tonya," "Wonder"
Best Original Score predicted nominees: "The Shape of Water," "Dunkirk," "The Post," "Darkest Hour," "Phantom Thread"
Best Original Song predicted nominees: "Remember Me" from "Coco"; "This Is Me" from "The Greatest Showman"; "Stand Up for Something" from "Marshall"; "You Shouldn't Look at Me That Way" from "Film Stars Don't Die in Liverpool"; "Mystery of Love" from "Call Me by Your Name"
Best Sound Editing predicted nominees: "Dunkirk," "Blade Runner 2049," "Baby Driver," "Star Wars: The Last Jedi," "Wonder Woman"
Best Sound Mixing predicted nominees: "Dunkirk," "The Shape of Water," "Blade Runner 2049," "Star Wars: The Last Jedi," "Baby Driver"
Best Visual Effects predicted nominees: "War for the Planet of the Apes," "Blade Runner 2049," "Dunkirk," "The Shape of Water," "Star Wars: The Last Jedi"
Best Animated Feature predicted nominees: "Coco," "The Breadwinner," "Loving Vincent," "Ferdinand," "The Lego Batman Movie"
Best Foreign Language Film predicted nominees: "The Square," "Loveless," "A Fantastic Woman," "In the Fade," "The Wound"
Best Documentary Feature predicted nominees: "Jane," "Faces Places," "Strong Island," "Icarus," "LA 92"
Best Documentary Short predicted nominees: "Heroin(e)," "Kayayo: The Living Shopping Baskets," "116 Cameras," "Edith+Eddie," "Heaven Is a Traffic Jam on the 405"
Best Animated Short predicted nominees: "Dear Basketball," "Lou," "In a Heartbeat," "Negative Space," "Revolting Rhymes"
Best Live-Action Short predicted nominees: "DeKalb Elementary," "Facing Mecca," "Watu Wote/All of Us," "Icebox," "The Eleven O'Clock"